We, Sabine and Sven started our sailing trip with our small sailing catamaran “Blue Felix” in April 2013 in the Netherlands. In April 2014 we left the Canary Islands, heading to the Cabo Verde Islands from where we sailed in May 2014 to French Guayana and Suriname. Since November 2014 we are cruising the Caribbean. Our journey finds now an end as we are going “on shore” again after the birth of our daughter Lea early last year on Martinique. I, Sabine, the board woman, tracked our expenses during our entire trip in order not to lose the overview on our budget. Now, with the coming end of our trip it is time to summarize and to transfer the accumulated data to a graphical form. This results occasionally in unexpected and funny correlations. We were roughly four years on our way, have traveled more than 7600 nm, visited 20 countries and sailed to 33 islands. During this we consumed approx. 1300 liters of Diesel, however, more than 200 liters were used for cruising the channels in the Netherlands for 1-2 month following the “Staande Mast Route”. Per day we covered 5.3 nm in average. If we would have walked for 2 hours every day we would have reached the Caribbean as well, concerning the distance only. In average we consumed approx. one liter Diesel per day. For every traveled mile (including the miles under sail!) this calculates to a consumption of 0.2 liters. We spent our nights as follows: 65% anchoring, 22% in marinas or on a jetty, 7% at a mooring, 3% on the hard and 3% of all nights we were sailing. It can be nicely seen that cruising with a sailing boat includes sailing for the least time. However, the numbers may shift if one cruises the Pacific Ocean as well as this would include much more nights on the sea. In the barely four years we used the port side engine approx. 380 hours and the starboard machine 400 hours. By calculation we used 1.7 liter Diesel per machine hour. We consumed 30 bottles of Camping-Gaz a 3 kg, in average we had to change the bottle every 45 days. According to this we consumed approx. 2 kg gas per month for cooking. For the oven we have a separate bottle, which we had to change 7 times. This calculates to a consumption of approx. half a kilogram of gas per month, mostly for baking bread. Since our departure we filled up water for ca. 230 €. But usually water was included in the European marinas and thus there were no additional costs for water. Explicitly we had to pay for water since May 2014 or for the last 32 month. Since we left Europe, we spend monthly ca. 7 € for water. Due to our possibility to catch up a high amount of rain water in a short period of time we hat to fill up water only when we had visitors on board and thus the water consumption was enhanced significantly. Indeed, we did not fill up water since May last year. Therefore a water maker, which we considered at the beginning of our trip, would have never paid out for us. With our outboard engine (6 HP, 4 stroke) we burned 196 liters of gasoline, which is ca. 4 liters per month. However, we used the dinghy frequently first after the Canary Islands and thus the consumption is about 6 liters per month in the Caribbean where we use the dinghy daily. We paid 254 € for customs and immigration, this money was spent mostly in the Caribbean. On our trip we consumed two sets of service batteries as well as one starter battery and one other battery for the windlass. We did not have major repairs neither minor repairs which we could not manage by our self. Calculated per day we invested exactly 4 € in marinas or moorings. This is surprisingly much as we did not go into a marina for over 2 years, except during hurricane “Matthew”. We experienced never a robbery, were attacked or had similar bad experiences. Obviously we had good luck but were always cautious and did not leave the boat very often after sunset. Also we secured the dinghy consequently, even when it was on the davits. For drugstore goods we spent 870 €, the majority of this we invested most probably in toilet paper :-). Doing the laundry consumed approx. 500 €. In addition, we have a small camping washing machine on board for the small laundry, which we do when the water tanks are filled up after rainfall. Per month this calculates to ca. 11 € for doing the laundry. On the first glance it is clear that the largest position is to keep the crew and the boat running. 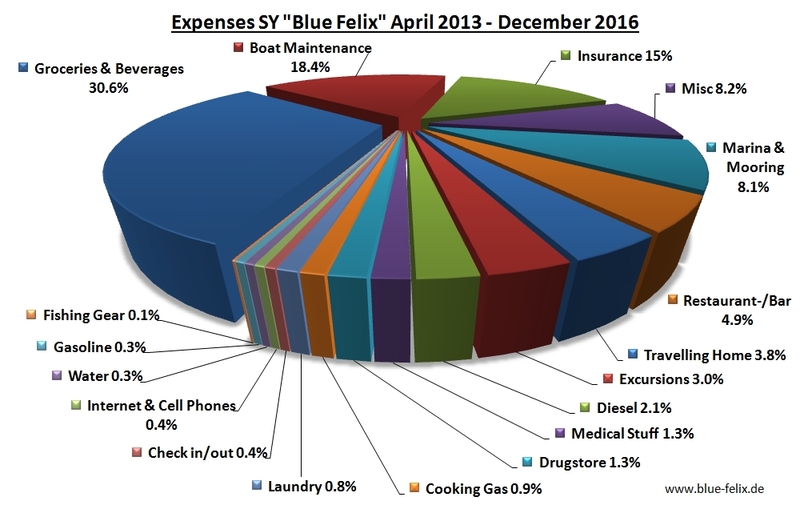 Nearly 1/3rd of our expenses are going into “groceries and beverages”. The position “boat maintenance” includes all works on the boat, such as hauling in and out, antifouling, machine maintenance, engine oil, etc. as well as all bits and pieces and whatever the boat else needs. Another larger position for us is “insurance”. A hull insurance we had in Europe only but this contributed to the total costs with 1% only and to the position “insurance” to 7% only. Nearly 60% of our expenses for “insurance” are due to health insurances, anyhow, this cumulates to 9% of the total costs. The next larger position is “miscellaneous” with 8%. This includes everything which cannot be attributed to another position, e.g. post cards, gifts, fees, clothes, things for the kitchen, and everything else which we obviously needed. Surprisingly large 8% we spent for marinas and moorings, mostly all in Europe. Roughly 5% we invested in restaurants and bars. The major part here was surely for drinks as we like to cook by ourselves. Three transatlantic flights home to Europe, one even with Lea, consumed approx. 4% of our budget, including all fees for trains etc. Further 3% were used for sightseeing trips on shore, i.e. fees for rental cars, busses, entrances etc. What was the total amount spent? I was looking for the cost per month. But the total cost would also help over how many months.